Our rich industry experience enables us to manufacture, export and supply superior quality Filter Presses. These machines are manufactured by our experienced professionals in sync with international quality standards. Further, our offered products are also tested on various parameters of quality. Widely demanded in domestic market for its salient features, this range is provided in varied customization options to suit the application where it can be used. 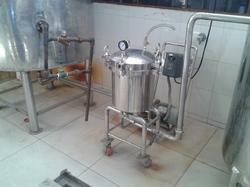 To attain maximum client satisfactions, we are engaged in offering Filter Presses to the clients. This machine is widely used in various industrial applications. The offered machine is manufactured from quality assured materials and modern technology in our state-of-the-art manufacturing plant. Looking for Filter Presses ?